Picard is sent on a mission to Romulus to discover why Ambassador Spock appears to have defected. I remarked back in "Sarek" that Sarek was acting as a stand-in for Gene Roddenberry. 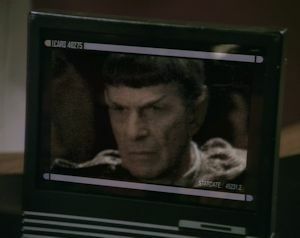 It is therefore not likely a coincidence that Gene Roddenberry gets a dedication following his death in front of the episode in which Sarek dies. Sarek's final scene with Picard is heartbreaking. You can see how Sarek is falling apart, and you can see how he reaches out with what little he has left to Picard, putting all of his hopes for reconciliation with Spock in him. It's pretty rough that Picard has to help him make the Vulcan hand gesture. I'm confused about how much contact the Federation has had with the Romulans over the last few years. According to "The Neutral Zone," it had been fifty years since anyone had heard from them, but Spock has maintained a relationship with a Romulan senator for many years (since the Khitomer conference, according to Sarek, which was over seventy years ago), there is footage of Pardek going back four years, the Enterprise-C encountered Romulans at Narendra III twenty-something years ago, and there is a general sense that there has been no serious dearth of information about the Romulans. Picard has a unique diplomatic style with Klingons. He remains cordial and polite like a human, but he tempers his niceties with venomous innuendo. While Klingons tend to respond well to bluntness, which is how Riker handled them in "A Matter of Honor," Picard knows that his diplomatic strength is in subtlety. The Klingon captain, K'Vada, is played by a completely unrecognizable Stephen Root, believe it or not. We last saw a Zakdorn in "Peak Performance." Data standing there would certainly make it impossible for me to sleep. It's a good gag, and Patrick Stewart has the perfect sense of comedic timing. It's good to see Data's confusion about how others deal with death further explored in the conversation he has with Picard after they learn about Sarek's passing. Man, it is awesome to see Spock again. I'm going to save a lot of what I have to say about this episode for the second half, but I will note that this is the first two-parter to take place in the middle of a season. The story being told is too big and too complex for a single episode, and the writers didn't want to wait until the end of the season to get to it. This is an important baby step, in that TNG is getting used to telling bigger and more involved stories.